"When a man is hungry, if you feed him with a fish, you feed him for that day; instead teach him fishing and you will feed him for the rest of his life." Inspired by the above Chinese proverb, KAVANAGAR MUZHAKKAM was founded on Februar,2002 by KAVANAGAR.RAMA.KANAGA SUBBU RATHINAM with a vision to awaken humanity. 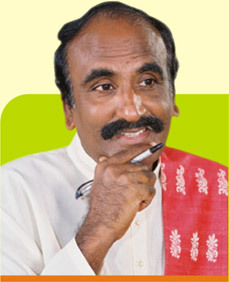 Thirukural Rama Kanaga Subburathinam is an unique personality among 7 crore Tamilians. KAVANAGAR MUZHAKKAM was established with the resolve to make every individual maximize and actualize his potential, not just temporarily but as a way of life, for KAVANAGAR MUZHAKKAM believes that all human beings have infinite potential but only a few perform to their full potential.